2015 has been a banner year for action-oriented spy movies. One early entry, Kingsman: The Secret Service, was a Valentine to '60s British titles. A similar claim could be made about the upcoming The Man from U.N.C.L.E. In November, James Bond will be back in Spectre. Mission: Impossible - Rogue Nation, the fifth installment of the TV series-turned-motion picture franchise, is American in origin but owes more than a small debt to the 007 movies from the Timothy Dalton/Pierce Brosnan era. Mission: Impossible (the movie series) has improved markedly since its rocky start. Perhaps it's that Tom Cruise has grown into the role of Ethan Hunt or perhaps it's because the films, by successfully distancing themselves from the TV inspiration, have gained a life of their own. Whatever the reason, this production joins its immediate predecessor, Mission: Impossible - Ghost Protocol, at the franchise's pinnacle. Some of the narrative contortions are rather silly (although the same could be said about every 007 outing) but the steady level of suspense maintained by writer/director Christopher McQuarrie more than compensates. Rogue Nation stretches all the way back to the TV series for the villain. The Syndicate, an evil "mirror" of the IMF, was teased at the end of Ghost Protocol. Here, it takes center stage under the leadership of a corrupt ex-British agent (played with steely antagonism by Sean Harris). Meanwhile, Stateside, CIA director Hunley (Alec Baldwin) succeeds in getting the IMF's charter revoked and having the agents absorbed into his organization. Ethan Hunt (Tom Cruise), globetrotting in Europe chasing the Syndicate, refuses to come in from the cold. He is soon joined in exile by Benji Dunn (Simon Pegg) and, later, by William Brandt (Jeremy Renner) and Luther Stickell (Ving Rhames). Hunt's investigation leads him to the beautiful, deadly Ilsa (Rebecca Ferguson), who alternately helps and betrays him, causing him (and us) to question whether she's a British agent, a double agent, or a triple agent. Whatever one thinks of Tom Cruise as a person and celebrity, there's no doubting his commitment to the Mission: Impossible series. In installment #4, he clung to the Burj Khalifa. 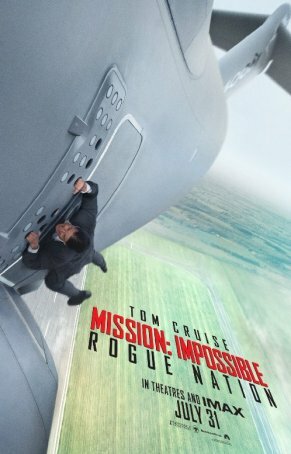 In Rogue Nation, to top that stunt, Cruise clambers around on the outside of an Airbus A400M without the benefit of special effects or a double. Although in many ways more daring than what he accomplished for the previous film, the airplane walk is less central to the plot and seems superfluous. It may be the most spectacular scene offered by Rogue Nation but it is by no means the most tense. That distinction belongs to an underwater adventure, a car and motorcycle chase, or the final confrontation. The action moves through many countries, stopping so briefly in some that we don't get a chance to sightsee. Filming was done in Vienna, London, and Casablanca, with those locations representing themselves and sometimes standing in for others (Paris, Cuba, and the United States). McQuarrie's screenplay has perfected the flavor of late-'80s/90's Bond - over-the-top action, cars and gadgets, and plenty of high-level corruption and double-crossing. The only element missing is a traditional "Bond girl." Rebecca Ferguson's Ilsa is just as physically intimidating and lethal as Hunt. She's more often the rescuer than the one in need of rescuing. And the film's romantic angle never goes beyond a little simmering sexual friction. The movie brings back a few of the characters who have appeared alongside Hunt during the franchise's 19-year run. Aside from Hunt, the only other IMF member to appear in all five installments is Ving Rhames' Luther. He's a supporting character with minimal screen time here but his presence is welcome. Simon Pegg, now in his third Mission: Impossible, gets a meaty part, trailing only Cruise and Ferguson for screen time. And Jeremy Renner, the only actor to feature in both the Mission: Impossible and Jason Bourne franchises, reprises his role from Ghost Protocol. Rogue Nation arrives in theaters at the tail-end of the summer season and its positioning may impact its ability to find an audience. Nevertheless, the film offers everything one could ask for from popcorn entertainment and its brand of action feels fresher and more freewheeling than anything we have seen since Furious 7 kicked things off. The tone is predominantly serious but there's enough humor to keep things light. Hopefully, the reception will be positive because, on the strength of this outing, a sixth big-screen impossible mission is warranted.